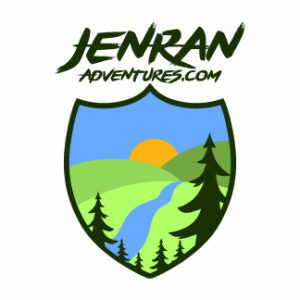 From our multiple national park adventures and vehicle maintenance work in South Dakota, we headed down to the Nebraska Panhandle (located in the western part of the state) to relax for a few days… but we discovered that perhaps this area of the state is the most diverse and interesting part of Nebraska! 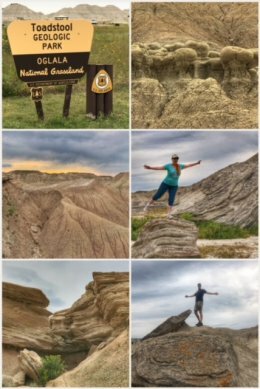 Our first surprise was a finding the badlands of Nebraska… with a visit to the Toadstool Geologic Park, located in the Oglala National Grassland in far northwestern Nebraska — about 15 miles north of Crawford — and managed by the Forest Service. We loved hiking the 1-mile loop trail through — and over — crazy rock formations… including the namesake toadstools. Among the badlands, scientists have found fossil remains of ancient camels, saber-tooth cats, horses, and more — which died and were buried by windblown volcanic ash some 12+ million years ago. Near the parking area, you can also visit a reconstructed sod-house — made entirely of sod-bricks that the early settlers had to use in the treeless plains. For a longer hike, consider taking the 3-mile Bison Trail, which leads to the Hudson-Meng Bison Kill area, where the fossilized remains of up to 600 bison have been discovered. Other possible places to visit (though we ran out of time) include Chadron State Park and Fort Robinson State Park. Fort Robinson is famous for where Chief Crazy Horse died from a bayonet wound from a perhaps overzealous soldier guarding him. 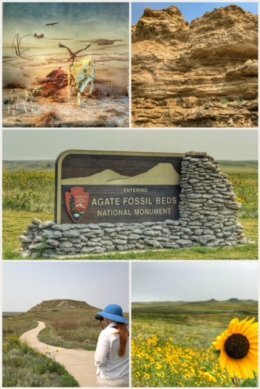 Continuing on our fossil exploration, we headed to the Agate Fossil Beds National Monument, located near Harrison, Nebraska — a must-see for anyone traveling this part of the country. This park is absolutely beautiful and has a gorgeous and impressive visitors center along with a paved trail all the way up to the two fossil beds. We started with the movie — which really everyone should do — and received an overview of the fossil beds that kind of blew our minds — that these two hills were once part of an ancient mud hole where now extinct mammals died, probably due to a severe drought. This park protects and celebrates one of the world’s most significant Miocene Epoch (20+ million years ago) mammal sites. Who knew that animals such as the horse-like ancient gazelle-like camels, beardogs, land beavers, pony-sized rhinoceros, chalicotheres, and others lived in Nebraska millions of years ago when the area was more of a serengeti environment. We hiked the 2.7-mile (RT) Fossil Hills Trail, which winds through the grassy prairie up to the two hills — University and Carnegie Hills (named for the paleontologists who worked on them; one was from Carnegie Museum and the other from several universities, including Yale and the University of Nebraska). It was on these hills that local rancher James Cook discovered fossilized bones in the mid 1880s. Amazingly, this national monument also tells the positive story of brotherhood among James Cook (and family) and Native Americans. Chief Red Cloud of the Oglala Lakota and his many family and friends camped in tepees bordering the Niobrara River to the east of the ranch house. They worked together and traded with the Cooks — and the vast collection of artifacts in the visitors center tells the story of this friendship. Next up was a stop further south and west on the Nebraska Panhandle — to the little town of Gering and the Scotts Bluff National Monument — a series of multiple high bluffs overlooking the North Platte River and the vastness of the plains… topping out at about 800 feet at its highest point, it once was a very important landmark for the Oregon Trail (and other pioneer travelers). Amazingly, scientists have discovered that these mostly sandstone bluffs are a remnant of ancient high plains that existed hundreds of feet higher than today’s plains. About 4-5 million years ago, the land began eroding faster than new deposits could be made — leaving only the bluffs with the strongest cap rock remaining. 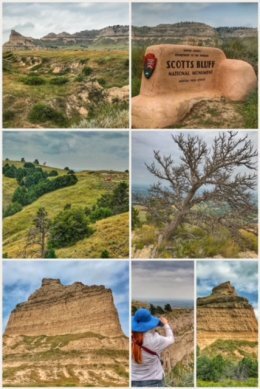 That said, even Scotts Bluff and the surrounding bluffs are slowing disappearing as time passes — much like the Badlands in South Dakota — and one day may be completely gone. Much to do at this wonderful little monument, including, of course, a stop at the visitor center for a short video orientation. From there you can hike up to top via the Saddle Rock Trail (3.2 miles RT) — or — drive to the top via a Civilian Conservation Corps-built roadway that includes three short tunnels. 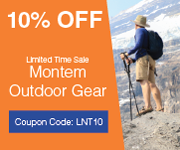 Amazing views and some fun trails await at the top. 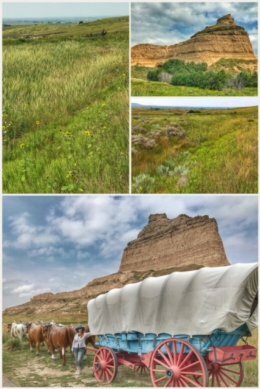 From the visitor center you can also access the Oregon Trail, the beginning of which includes some replica wagons (as shown in the collage, with Scotts Bluff behind it). We have now seen it more than once, but it still amazes us that the ruts from this great migration of people still exist in certain places along the trail. But then again, from 1840 to 1869, more than 500,000 people headed westward on the Oregon Trail. Plus, this trail was also part of the Mormon Trail, California Trail, Pony Express, and used by numerous transporters of goods traveling both east and west. Next up? Back to Wyoming, as we zigzag through the state on our way to a very long stay in Utah.